Great for limited use. 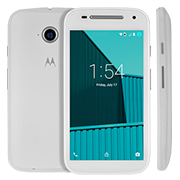 FreedomPop has a certified refurbished Moto E 2nd Gen LTE with FreedomPop Free Service. Be sure you uncheck Extended warranty and Visual Voicemail. 90 day warranty. Cancel anytime without fees. Includes 500MB data, 200 voice minutes, 500 text message a month on the Sprint 4G network. Review - 14 day money back guarantee. You can pay a little more for upgraded minutes or data. This is a great deal if you have limited smartphone needs or on a budget. You will still get a pretty powerful smartphone.